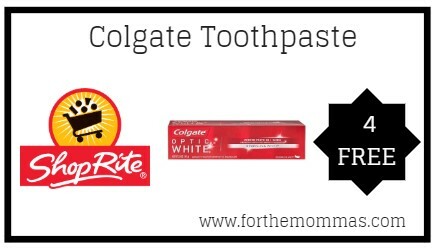 ShopRite: FREE Colgate Toothpaste Thru 1/26! Thru 1/26, ShopRite will have Colgate Optic White Toothpaste priced at $1.49 each. In addition to this, we have a couple of Colgate products coupons available. Stack it with a ShopRite ecoupon to make your final price FREE! !